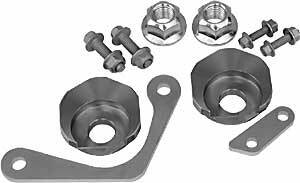 Correct alignment angles on previously non-adjustable suspensions with adjustable OEM designed components. The simple remove and replace design makes SPC performance parts ideal for quick and easy alignment adjustments as well as simple chassis part replacement. The new adjustable suspension components have an extended range of camber and caster adjustments, once completed toe adjustments can then be used to complete the alignment. Does SPC 86640 fit your vehicle?